This multimedia poem was written by Jody Zellen, using a “page space” developed by Deena Larsen for this collaboration. Each of the question marks responds to a mouseover by triggering a line of verse moving diagonally across the poem’s surface along with a sound. The title’s reference to the flesh and the use of heartbeat, sonogram, and voice recordings saying things like “breathe” all reinforce a surgical conceptual framework, and metaphorically framing the diagonal language movement as cuts, slashing across the screen. The occasional variations in the sounds and word movement place the poem in conversation with some of the urban concerns which are so central to Zellen’s poetics, while the literalization of a metaphor through interface design is part of Larsen’s. 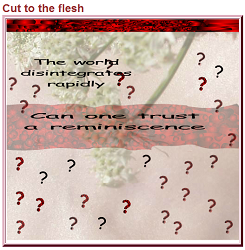 As one question leads to many others and each inquiry cuts deeper into the flesh of this document (which is ultimately closed to us, since it was written in Flash), the poem exposes what seems to be a blood vessel, from which lines of verse flow to bring the poem, and collaboration, together.